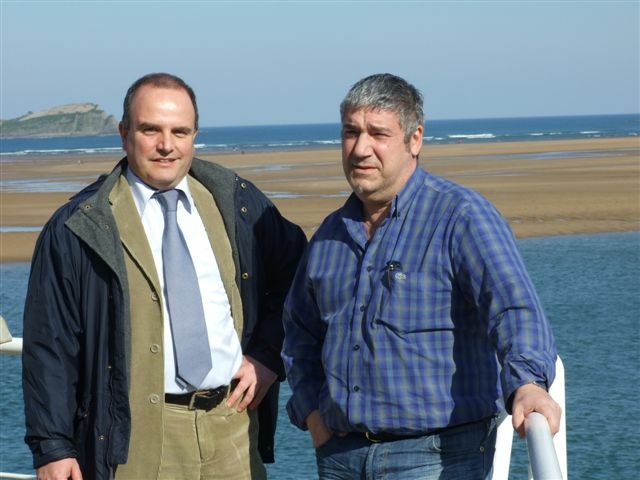 On the 9th of February 2011, Mr Paolo Bray, Friend of the Sea’s Executive Director, travelled to Bermeo, Spain, to shake hands with the first of 15 observers, before boarding them on tuna purse seiners of Spanish shipowners Atuneros Vascos, Inpesca, Pevasa and Seabreeze Ventures. The vessels are part of the Pevaeche group. Observers have been approved by Friend of the Sea and they will report on all aspects related to the potential environmental impact of fishing operations. AZTI, Tecnalia the Basque Technological Centre specialized in Marine and Food Research, has provided the experienced observers. Relevant data, such as bycatch and footage of fishing activity will be made available to interested stakeholders and NGOs. It will help to further improve fishing policies of the afore mentioned Spanish companies, which are already among the most restrictive in terms of handling bycatch, waste and energy management. The fleet consists of six modern tuna fishing-freezer boats (Playa de Bakio, Playa de Azkorri, Juan Ramón Egaña, Txori Berri, Txori Urdin and Txirriñe), registered with ICCAT (The International Commission for the Conservation of Atlantic Tunas) which fish in the Atlantic ocean. The tuna vessels have been the first to gain Friend of the Sea certification in Europe. The group is also approved Dolphin Safe by the Earth Island Institute.